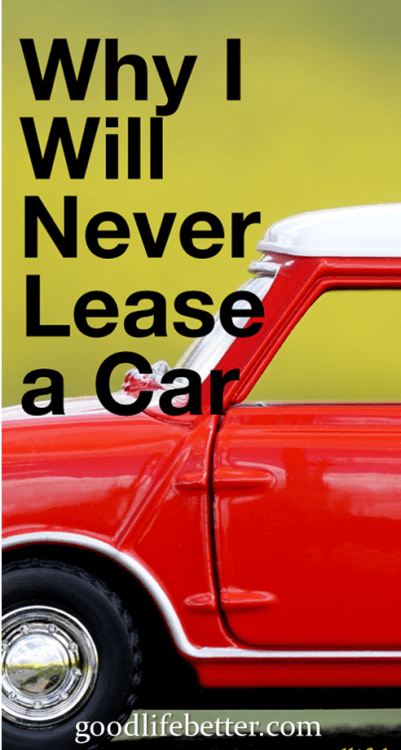 Why I Will Never Lease a Car | Good Life. Better. I hate most things about buying a car. I hate driving up to the lot and walking around. I hate doing test drives. I hate trying to decipher the price information sheet on the window. And, not surprisingly, I hate negotiating on a price. Once I have figured out what make and model I want to buy, my goal is to go from decision to driving off the lot in as short a time as possible. And I want to go through this process as infrequently as possible (no more than once a decade if I can help it). That is why I cannot for the life of me understand why anyone would want to lease a car. Leasing—a fancy word for renting—a car means I am voluntarily entering into a long-term relationship with a car dealer that benefits me in one way only: I get to drive the car for the period of the lease. In every other way, leasing a car benefits the dealership. They get any down payment I am required to pay, my monthly lease payment, and they get returned to them a low mileage used vehicle that they can then sell for a profit. And if I fail to return the car in the agreed upon condition? Then they get to charge me more money. Two recent conversations have reminded me why I will never lease a car. I share them here so hopefully other people can see how little financial sense leasing a car makes. During a recent shopping excursion, I got to ride in my friend’s new car. Before buying this car, I knew she had done a lot of research and had determined that the three things she valued most (other than reliability, of course) were comfortable seats, and a smooth and quiet ride. The car she bought satisfied her expectations in these areas. She was having second thoughts, however, because the payments were high. She said she wished she had just leased the car because then she would have had smaller payments. It took me a minute or two to figure out how to respond: her struggle with the payments was real even if her conclusion that leasing would have been better didn’t make sense to me. I started with pointing out the very real differences between leasing and buying. Currently, she was paying down the costs of an asset that was essential to her day-to-day world and that she would, once she cleared the loan, own the car outright. At that point, she would be able to drive it for as long as it worked paying nothing more than the cost of maintenance and the the state license fee. If she had leased instead, she would have paid a one-time deposit and then a monthly fee during the life of the lease at the end of which she would own nothing. Yes, the monthly lease payments might have ended up being less than her monthly loan payments. But to make a true comparison she would have to factor in the deposit and the fact that at the end of the lease—after paying all that money—she would own nothing and have no choice but to buy (or lease) another car. Once this cycle began, she would be forever limiting the cash she had available to pay down other debt and to invest for retirement, all to decrease her monthly payment. That seems like a really crappy trade-off to me. Still puzzled, I asked him why he needed a second car. Turns out, he had recently moved about four miles from his current place and when he did the calculations he realized that just that short distance was likely going to mean he went over his allotted miles on his leased car and it was too late to purchase additional miles at the lower rate. Once again, I struggled with how to respond. I knew he had some cash saved so could buy the car outright but I also knew that he was hoping to buy a house soon and that this cash was earmarked as his down payment. Finally, I just told him I thought he should really think about it before he did it. I reminded him of the other costs associated with owning a car including insurance, maintenance, and fees, and that, while I knew it would be hard paying a penalty when his lease ended, I couldn’t imagine what he would be charged would be as much as the cost of owning a second car. I also reminded him about how he hoped to soon have enough saved to buy a house. The next day he let me know that he had decided not to even test drive the other car and to just stick with the one car. Does Leasing a Car Ever Make Good Financial Sense? Given the dislike I expressed above for leasing a car I am sure you expect me to say emphatically that there is no circumstance in which leasing a car ever makes good financial sense and in that you would be right. And I am not alone in believing this. Search for “Dave Ramsey car lease rants” and you will find many very entertaining explanations why leasing is a bad money decision. However, I also grew up in a household with unreliable cars that regularly stalled in the middle of intersections while other vehicles honked from what seemed like every direction. As such, I will bend so far as to say that while leasing is always a bad financial decision it may be a reasonable life decision. I will bend so far as to say that while leasing is always a bad financial decision it may be a reasonable life decision. I can’t in good conscience advise someone to get a car that could leave them and their kids stranded when they could for the same payment get a reliable car that will give them some much needed breathing room while they plan their next move. It isn’t a long-term solution and the car they decide to lease should be the least expensive option that will safely transport their family, nothing more. 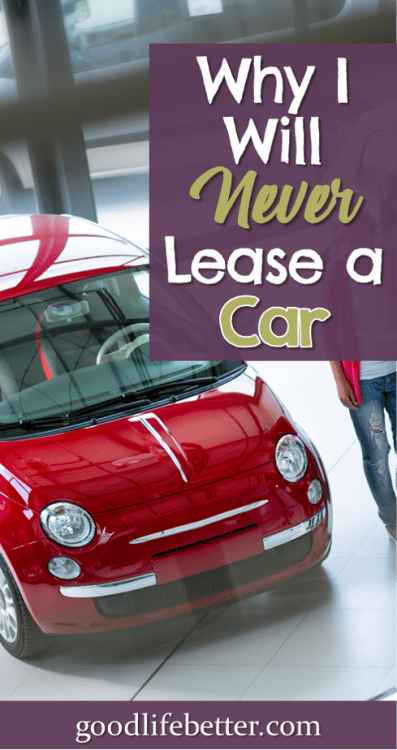 Have You Ever Leased a Car? What is your experience with leasing a car? Have you had similar conversations with friends? 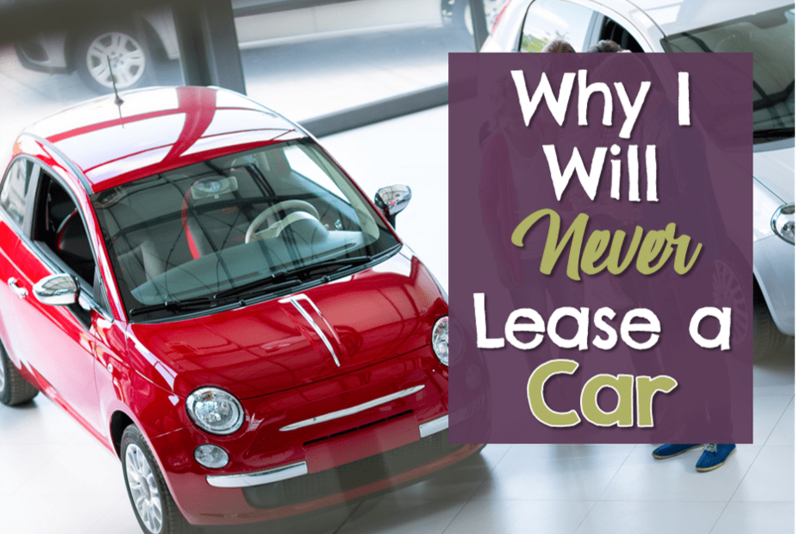 Leave me a comment below and tell me why you will never lease a car. Until you have a net worth of millions having a new car is an extravagance. In fact even though my net worth qualifies I still buy used cars with cash. My wife’s car is a 2006 and she routinely drives it on 200 to 500 mile road trips by herself. We just got back from a 2600 mile eclipse watch and mountain hiking road trip in my 2011 Toyota(our “new” car). You did a good job of showing how bad leasing is, the worst way to get a car! Lease payments and car loan payments keep people enslaved. And for what? To impress strangers? I prefer 7 figures of investments and never having to go in to work again. 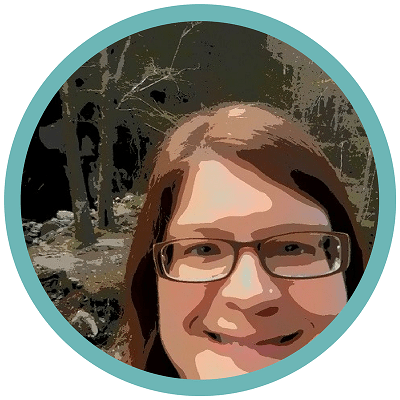 Thank you–so glad you liked the post! I definitely prefer investing extra money vs. driving the latest and flashiest vehicle.